As one half of the beautiful vocal sound of Abba, Frida became a superstar around the world. Both before her career with Abba and after the band stopped working together, Frida recorded some great albums that are well worth seeking out. In her early career she covered both David Bowie and The Beach Boys (check out the compilation Frida) before later recording a hugely successful album, Something's Going On with Phil Collins and very much did her own thing musically when she had the freedom to choose her own material. Frida was born Anni-Frid Synni Lyngstad in a small village near Narvik, in northern Norway, to a young Norwegian girl and a German soldier; her father returned to Germany when Germany left Norway towards the end or the war. Fearing reprisals against Frida's mother her grandmother took two year old Frida to Sweden, where she was joined shortly afterwards by her mother; tragically aged twenty-one her mother died of kidney failure, leaving Frida to be raised by her grandmother. It was her grandmother who encouraged Frida's love of music and by the time she was 13 she joined a dance band. With the Evald Eks Orchestra, Frida performed each weekend and she sang standards like, 'All of Me' and 'Night and Day'. Two years later she joined a 15-piece big band, whose repertoire included Duke Ellington and Count Basie before forming her own band, the Anni-Frid Four when she was nineteen. Three years later she won a Swedish TV talent competition that secured her a recording contract with EMI Sweden. 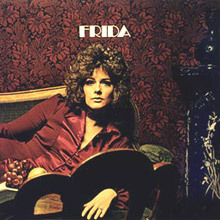 A week later Frida recorded her first single for EMI Sweden, this and the other early songs she recorded in Sweden are included in the compilation Frida 1967-1972. On 29 January 1968, she performed her first single on Swedish TV, and briefly met Agnetha Fältskog, who also performed her first single in the same programme. The following year she entered the Swedish heats for the Eurovision Song Contest, finishing fourth, and backstage she met Benny Andersson, a fellow contestant. Shortly after they began seeing one another regularly and became a couple. Frida's first album was produced by Benny and released in 1971 and she secured her first Swedish No.1 hit with 'Min Egen Stad' ('My Own Town'), with backing vocals by Benny, Björn and Agnetha; it's included in the compilation Frida 1967-1972. In 1972, she moved to the Polar Music label and recorded 'Man vill ju leva lite dessemellan' ('One wants to live a little in between'), which became her second Swedish, No. 1. Her next solo album in Swedish, was Frida ensam (Frida Alone), some of the tracks, including her cover of David Bowie's 'Life on Mars' and The Beach Boys, 'Wouldn't It Be Nice' in Swedish are on the compilation Frida that was largely produced by Benny, but by this time Frida was fully involved with Abba. Frida's album includes her Swedish version of 'Fernando', and it was made while Abba was recording Waterloo and competing in Eurovision. From this point on Frida devoted herself to all things Abba and in so doing became a superstar around the world. In 1982, Frida recorded and released her first post-Abba solo album. This was also her first solo album in English. The Phil Collins-produced album, Something's Going On, became a big success worldwide and some tracks, including, 'I Know There's Something Going On', which topped the charts in Switzerland, Belgium, and France, as well as No.13 in March 1983 on the Billboard Hot 100 are also on the compilation, Frida. 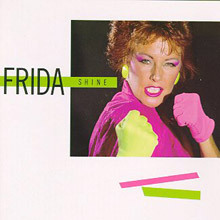 In 1983, Frida began work on her next album, the experimental Shine recorded at Studios De La Grande Armée in Paris, France that was produced by Steve Lillywhite, known for his work with artists like Peter Gabriel, U2, and the Rolling Stones. Lillywhite gave Frida an edgy sound, way removed from what she was known for with Abba. It is well worth checking out as it is one that may have gone under the radar. After this Frida's singing career was placed into semi retirement. She did the odd project close to her heart but hers was very much a life lived in privacy, except for her charitable work concerning the environment. On 26 August 1992, Frida married Prince Reuss, but it was a life marred by great tragedy. The prince died of lymphoma in 1999; a year earlier Frida's daughter, Ann Lise-Lotte Casper (born Fredriksson when Frida was married to her first husband), died in a car accident in New York state. In 1996 Frida released Djupa andetag (Deep Breaths) and then in 2004, Frida appeared with Benny Andersson and Björn at the fifth anniversary performance of Mamma Mia! In London. Frida had invested in the show's production but as with the movie, Mamma Mia she had no creative involvement. Fans of Abba's sugary-sweet pop songs will no doubt be surprised by Something's Going On, the remarkably hard-edged 1982 solo album by Abba vocalist Anni-Frida Lyngstad, better known simply as Frida. Produced by Phil Collins, Something's Going On includes a wide range of material, including songs written by Bryan Ferry ("The Way You Do"), Stephen Bishop ("Tell Me It's Over"), and Gerry Rafferty ("I See Red"), and even includes a Dorothy Parker poem set to music ("Thernody"). Something's Going On boasts impressive guitar work by Daryl Stuermer, who has toured with Genesis as well as appeared on several Collins solo albums. Collins' drum work is also outstanding, particularly on the hard-hitting hit single "I Know There's Something Going On." Frida herself shows an unexpected emotional range given Abba's two-dimensional pop gloss. Sure, she still chirps and tweets like a bird, but the diversity of the material and the freedom of recording solo obviously allows her to enter different musical territory. Frida escapes the creative limitations of being a member of one of the world's most popular groups on this solid and often riveting album. 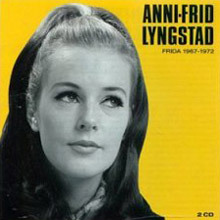 Frida is the 1971 debut album by Anni-Frid Lyngstad, consisting of Lyngstad's very personal and "jazzy" cover versions of English or American songs. By the time of the album's release Lyngstad had been signed to EMI/Columbia for four years. 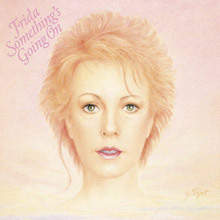 Frida, recorded in late 1970/early 1971, produced by her then fiancé Benny Andersson and Bengt Palmers (Blue Swede, Harpo), was to be her first full-length studio album for EMI. The album received unanimously generous praise from the critics, who especially noted the precision and versatility of Frida as a vocalist. For example, Sweden's biggest morning paper "Dagens Nyheter" (Daily News) wrote: "Professional, sure and certain LP-debut...low key but self-sure personality with sprinkles of both temperament, humor and tenderness. And she sings in this way that you understand she´s got something between her ears - she sings with others words in a very intelligent way". 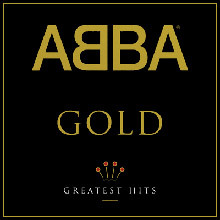 The album was also re-released the following year as she had her first Svensktoppen number one, "Min Egen Stad", adding this song as track 1 side B.
Frida's second post-ABBA solo album followed fairly closely on the heels of Something's Going On, but was more ambitious. With Steve Lillywhite producing, the singer stretches out on a string of memorable and bold songs that have her generating more power and excitement than the prior album; she clearly loves the melodies here, and embraces them all, boosting her range in the process. A lot of it may be mere rock posturing, but she pulls it off, pushing her pipes and also singing with a bracing, dramatic urgency on pieces like "One Little Lie" and the title track. Lillywhite gives her a more integrated band setting in which to work, which overall made for better, tighter ensemble work between singer and musicians and -- coupled with the high quality of the songs -- ended up delivering a more compelling album, if not a more successful one.